If you’re slightly older than me, you may have dabbled in the mixtape era, dubbing individual songs onto a cassette tape. 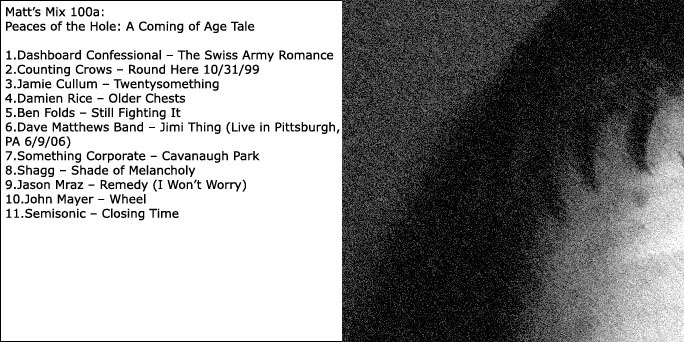 Aside from a few cassettes of songs that I recorded from the radio, the mixtape era predated my music obsession. Had I been a teen in the 80s, I no doubt would’ve spent countless hours painstakingly putting mixtapes together. Instead, as the 90s came to a close, my older cousins showed me the newest piece of technology that came with their new computer: a CD burner. I was in awe. A CD burner meant the best of both worlds: the freedom to pick and choose your favorite songs and the power to organize them all in a way that made sense to you. Keep in mind that iTunes and the iPod were still more than a year away from being created at this point in history. The CD burner took the mixtape to a whole new level, and I wanted in. Ironically, the first ever Matt’s Mix CD wasn’t burned by me. My cousins asked me to send them a list of songs I liked at the time, and they burned the CD for me. It was the year 2000. I was a high school freshman, so I’m sorry to say that the opening track was Creed’s “With Arms Wide Open” and the closing track was Kid Rock’s “American Badass.” Suffice it to say that my musical tastes have shifted, expanded, and matured over the past 15 years. Nevertheless, I can still sing along with almost of the words from all 17 tracks that were included on the original Matt’s Mix, which included songs like Train’s “Meet Virginia,” the Red Hot Chili Peppers’ “Otherside,” and The Verve’s “Bittersweet Symphony.” After I received the burned disc, I added some artwork featuring the words “Matt’s Mix.” It was a generic blue/green design, but it set a precedent that holds to this day: every official Matt’s Mix would include album art. Soon thereafter, I convinced my parents to buy a CD burner for our home computer. Therefore, the first Matt’s Mix that I created myself was actually Matt’s Mix II. I think I opted for roman numerals because Super Bowls and WrestleManias used roman numerals. Whereas the original Matt’x Mix was rock-centric, Matt’s Mix II was all rap music (plus whatever genre is assigned to Limp Bizkit). 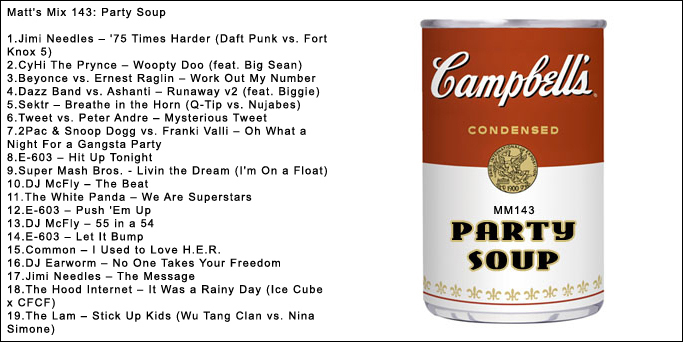 Matt’s Mix II also featured the first Matt’s Mix appearance by a 30 at 30 artist (Jay-Z). 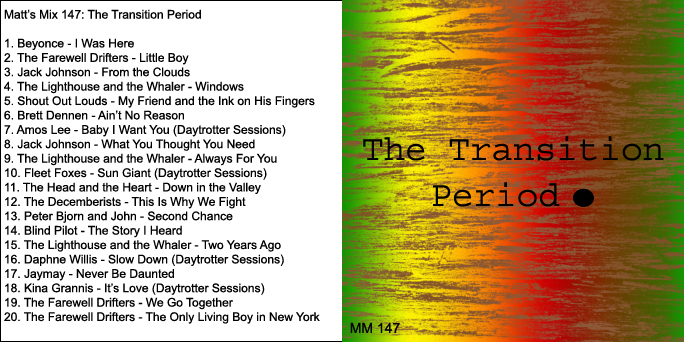 With few exceptions, the early Matt’s Mixes were organized by genre and time period. There wasn’t much backstory or symbolic significance that went into their creation as evidenced by the mostly generic cover artwork that accompanied them. That is all fitting since my life was pretty ordinary and uneventful at the time. On Matt’s Mix XLIV I put my high school senior yearbook photo on the cover of the CD. I then began incorporating more images, including an altered Raiders logo, the Simpsons family, and the Teenage Mutant Ninja Turtles. Still, the connection between the cover art and the music was minimal, if it existed at all. Like so many artists before me, it took heartbreak to inspire me. 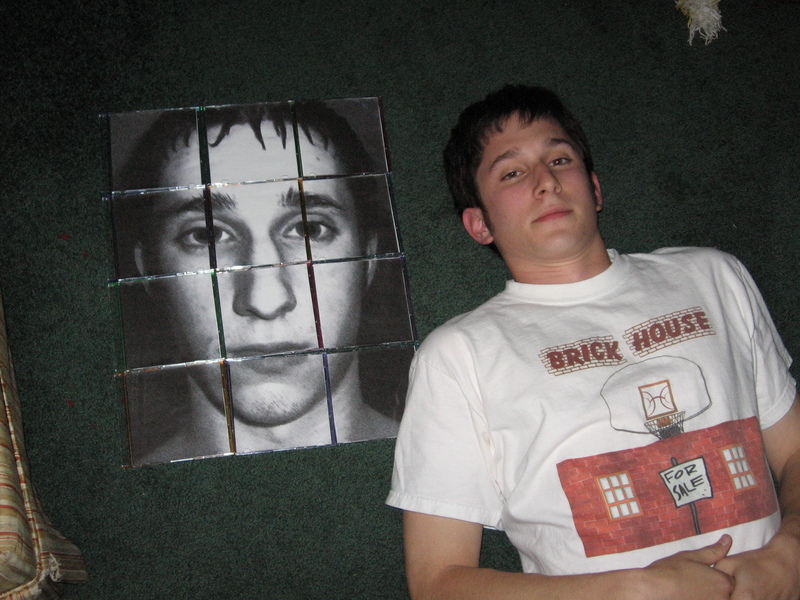 After my girlfriend broke up with me as a freshman in college in January of 2004, I coped by creating four Matt’s Mixes that visually and musically reflected by feelings at the time. A similar experience later that summer marked a turning point in the history of Matt’s Mixes. 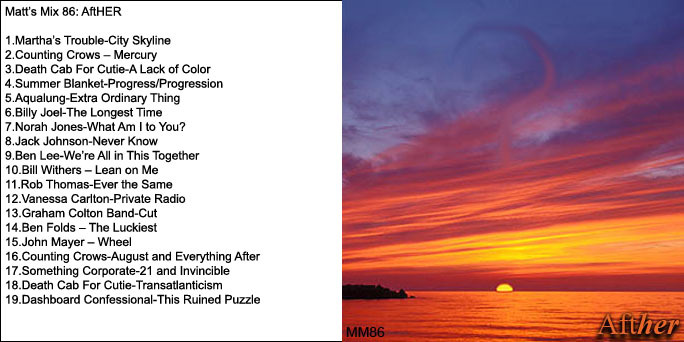 Beginning with Matt’s Mix 68, I dropped the roman numerals and began titling each CD. 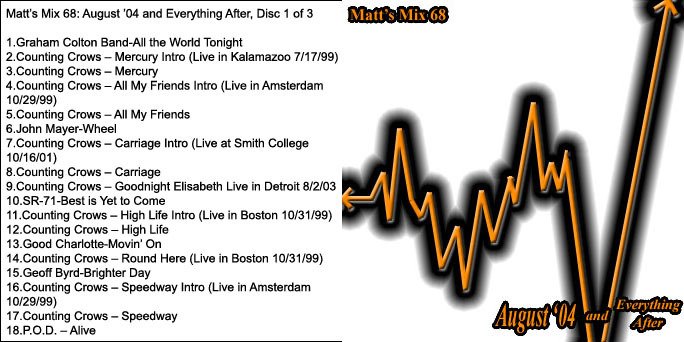 Matt’s Mix 68-70 kicked off the new era with a three-disc set that I named August ’04 and Everything After. 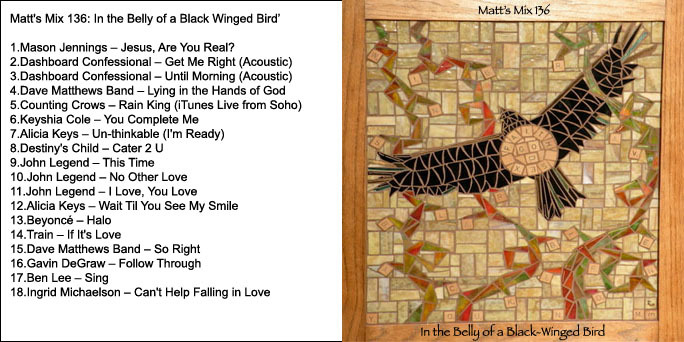 Inspired by Counting Crows’ debut album, August ’04 and Everything After really marked the start of the modern Matt’s Mix. For me, it was more than just putting songs together on a CD. It was a holistic artistic expression encapsulating a moment in time or season of life. 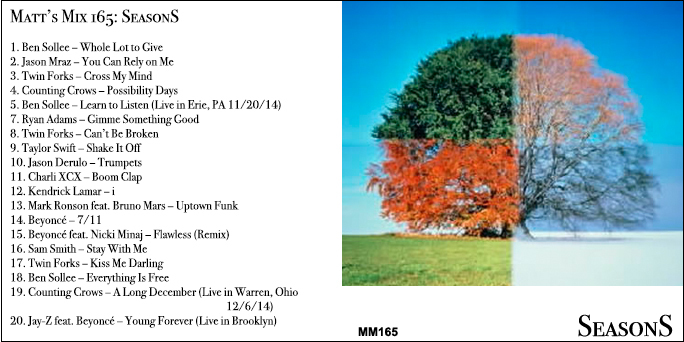 I recently made Matt’s Mix 167, meaning that I have now made 100 “modern era” Matt’s Mixes. To me, they are a modern, multi-faceted form of storytelling. From the cover art to the sequence to the time constraints, everything has to fit together. While playlists and shuffle buttons have their place and time, there is something extra special about organizing a finite list of songs to be listened to in a predetermined sequence and then tying it all together thematically with a piece of album art. That is a Matt’s Mix in a nutshell. Every single one of them has some level of personal significance to me. Therefore, attempting to select and rank the top 30 Matt’s Mixes seems like an extremely daunting task, but I’m going to give it a go anyway. This compilation of mashups features several smooth grooves that are sure to be party pleasers. As the name implies, I made this when I turned 25. OK, so “crisis” may have been a bit strong. Nevertheless, the songs fit my mindset of the time. It was about a year after Jessie and I had gotten back together and about a year away from when we got engaged, so I was caught in between not knowing exactly what the future held for us. 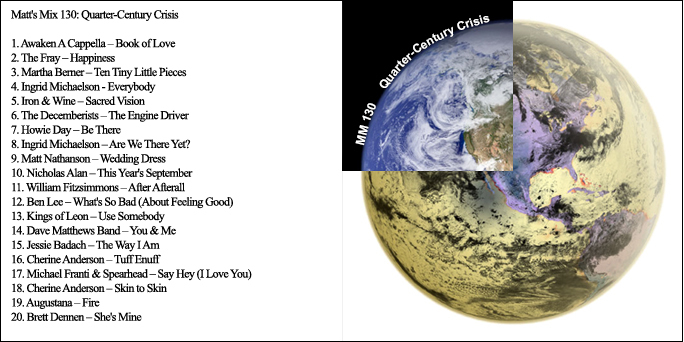 Created earlier this year, this CD was organized to mirror the changing seasons. Imagine track one is the start of the year in winter. Spring hits with “Possibility Days.” The start of summer is signified by “Shake It Off.” Fall arrives with “Stay With Me.” And “A Long December” wraps things up the year in winter again. There’s a symmetry in the way the calendar both begins and ends in the same season (winter), hence the uniquely formatted title “SeasonS.” The closing track is a live version of Jay-Z’s “Young Forever” with Beyoncé singing the refrain of “I want to be forever young” while we recognize that another year has gone by and another season of life is about to begin. 27. Matt’s Mix 152: Four Days in L.A.
A few years ago, Jessie and I traveled to Los Angeles for our friends’ wedding. It was a whirlwind experience that we won’t soon forget, especially since we commemorated it with this soundtrack. 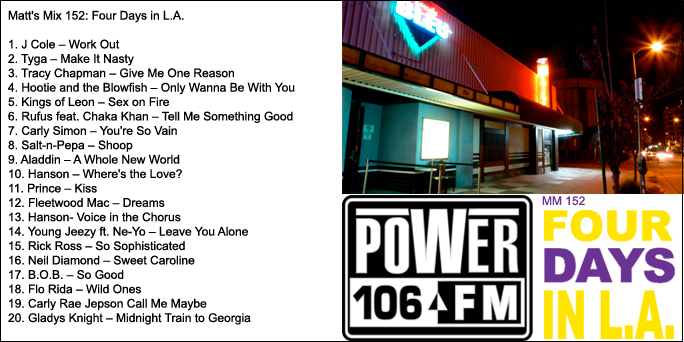 Tracks include songs from a memorable karaoke night as well as songs we heard on the radio driving around in crazy L.A. traffic. 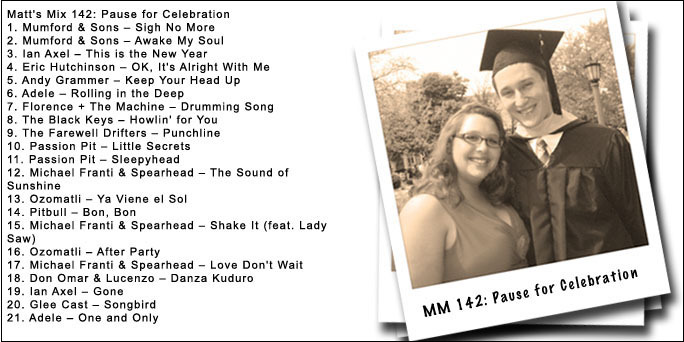 This ode to graduating college is bookended by a pair of great live tracks, DMB’s “Two Step” and Jamie Cullum’s “Next Year Baby.” It wasn’t until my junior year that I really felt a strong connection with Mercyhurst. By the time senior year came to an end, I clearly was not in a hurry to leave as evidenced by my inclusion of R.E.M.’s “It’s the End of the World As We Know It” on this mix. I don’t remember what I Googled to find this photo, but it was a striking image that fit the mood I was seeking for this mix. 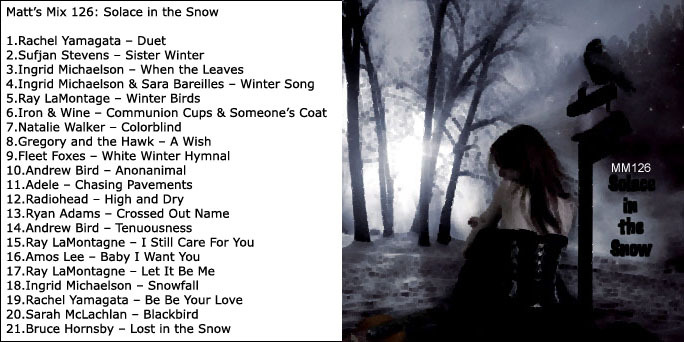 Solace in the Snow is a definitively winter-sounding album to me (and not just because three songs have the word “Winter” in the title). Yet amid all of the slow, somber, brooding songs on this mix, it is “Lost in the Snow” by Bruce Hornsby that is the final song the listener hears. The joyfulness of the piano solo in that song is like a musical antidepressant. It gives the listener a sense of hope and optimism, which is something I often need in the dead of winter. Thankfully, this mix delivers the medicine every time. In the spring of 2011, I earned my master’s degree in secondary education. Later that summer I would be getting married and then hopefully beginning my teaching career. But first, I made this mix to commemorate the occasion. Pause for Celebration is a feel-good mix of upbeat songs that closes with what would later be the first dance at my wedding. Seinfeld is one of my all-time favorite TV shows. 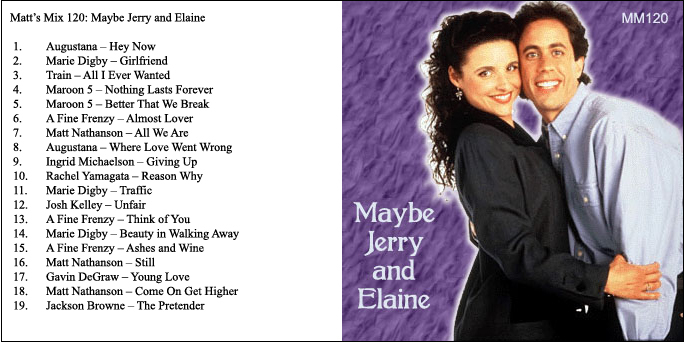 As fans of the show know, Jerry and Elaine had a romantic history, but they did not end up together when the show wrapped up. They were “just friends.” In 2008, after years of believing Jessie and I had more of a Cory and Topanga relationship, I feared that maybe we were actually meant to be more like Jerry and Elaine. And that was the inspiration for this mix of songs. 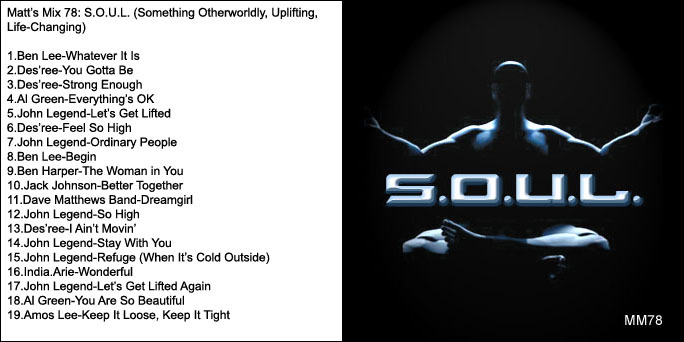 This mix was compiled in January 2010. The he final track, Death Cab For Cutie’s “A Diamond and a Tether,” foreshadows the engagement that was still several months away at this point. Yet, it was clearly weighing heavy on my mind at the time. I remember intentionally titling it A Tension as opposed to simply “Tension” because I liked the double meaning with the homonym “Attention” as in, are we paying enough attention to each other? Something about the winter gets me all lost inside my head. In 2006, I participated in a mission trip to Vanceburg, Kentucky. It was a formative faith experience for me, and the fact that Jessie was on the trip as well made it all the more meaningful for me. The week in Kentucky was filled with God’s presence, especially in the music that was played up on the hill. No studio recordings can capture that spirit, but this mix of folksy tunes, gospel hymns and campfire sing-alongs comes close. This mix was made in October 2011, a few months after Jessie and I became married. We were “transitioning” to married life and living together. I accentuated the period in an attempt to emphasize that the transition was a significant one. With a few exceptions (I’m looking at you, Beyoncé), the music consisted primarily of off-the-beaten-path artists, including several that came from the movie Happythankyoumoreplease, which gave this compilation a sort of indie music feel. 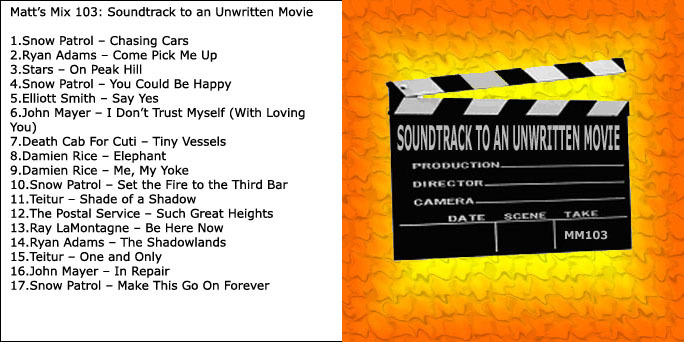 Speaking of artsy movie soundtracks, Matt’s Mix 103 was compiled in a way that it could accompany a movie (that I never wrote). The sequence of songs, which has Snow Patrol in the beginning, middle, and end, was meant to help tell a story—a love story—played out on the big screen in my mind. I don’t totally recall the plot lines that I had sketched out, but I still enjoy the soundtrack, and I bet that if I listened through it enough, I could piece things together again. Who knows, maybe it’ll still come to fruition some day. Faith is the unifying theme of this mix. The title is taken from the Counting Crows’ song “Rain King”, a version of which was included on the mix as track 5. The songs start with a question and end with love. That seems like a somehow fitting description of my faith. When I have unanswered questions, more often than not, love guides the way. Long story short, I once described the relationship between Jessie and I using the metaphor of a house. The first floor represented communication, the second floor represented shared experiences, etc. 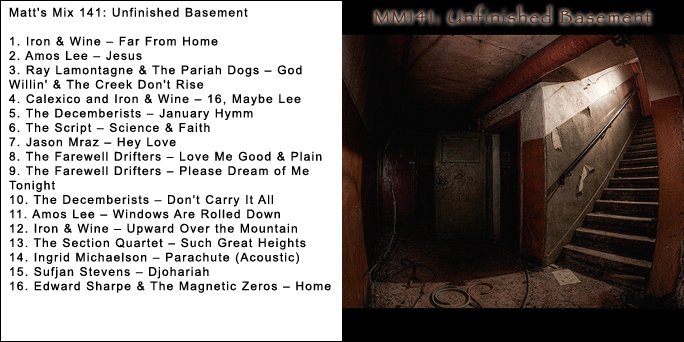 The basement was our shared faith. Like many homes, our relationship’s basement gave us a firm foundation to build upon, but it was unfinished. There was a lot of potential for our faith/the basement to become a much more valuable part of our relationship/the home. 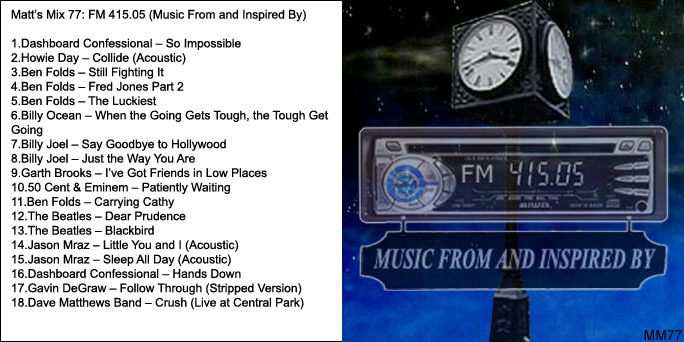 Musically, the songs start with “Far From Home.” What follows are several faith-strengthening and faith-challenging songs. 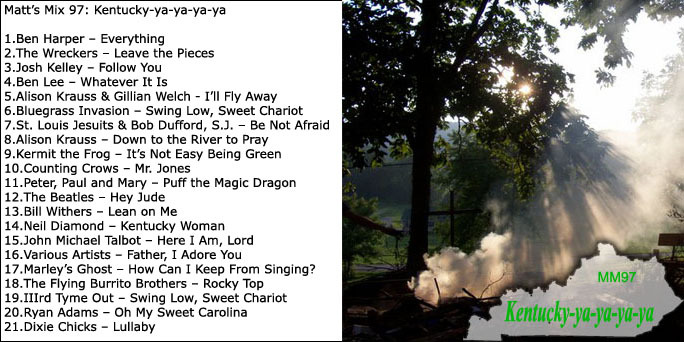 Then comes track 15, Sufjan Stevens epic song “Djohariah”, which is a prayer-like experience itself. It’s only after getting through “Djohariah” that the listener arrives “Home” with the final song by Edward Sharpe & The Magnetic Zeroes. 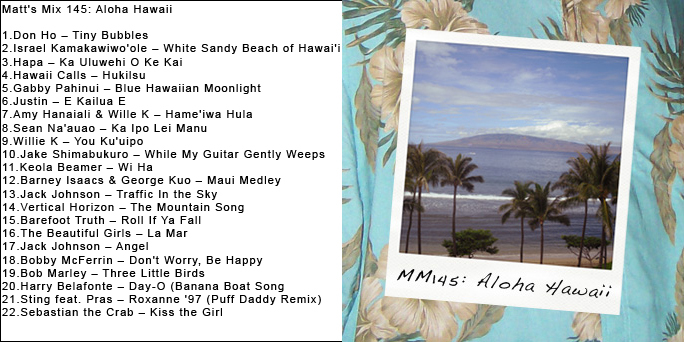 Inspired by a honeymoon vacation in Hawaii, this mix of relaxing tunes takes me back to the white sandy beaches of Maui. Our 10 days in Paradise went by quickly, so it’s nice to be transported back through this mix of music. 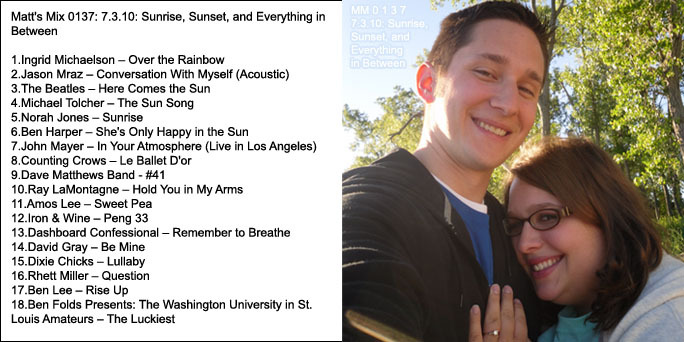 This meditative mix of songs was compiled not too long after Jessie and I had our first unofficial date. I had a sense that we had something special together, even if I could not quite articulate it at the time. This mix of songs was a great way to unwind and let my mind be free to contemplate the possibilities of what the future could hold. In mid-August 2008, the longest and final breakup from Jessie came to an end. The Summer Olympics were taking place during that time, hence the gold medal image on the cover. Additionally, our motto upon getting back together was that we were “In It To Win It” this time. After spending a few months apart, we felt a renewed sense of dedication to make us work. This time our relationship stuck. We never broke up again. Compiled a few weeks before Valentine’s Day in 2006, Bigger Than the Both of Us was my first attempt to organize a mix of songs that expressed my complicated feelings about love and faith as a twentysomething. The title was my way of saying that together we were better off than we were individually. Somehow—through God—love made us bigger, stronger, better people. Depending on your perspective, you might view my twentysomething tendency to save Jessie’s voicemail messages on my cell phone as either obsessive or romantic. I prefer the latter, although I can understand why some might say I pushed the boundaries. 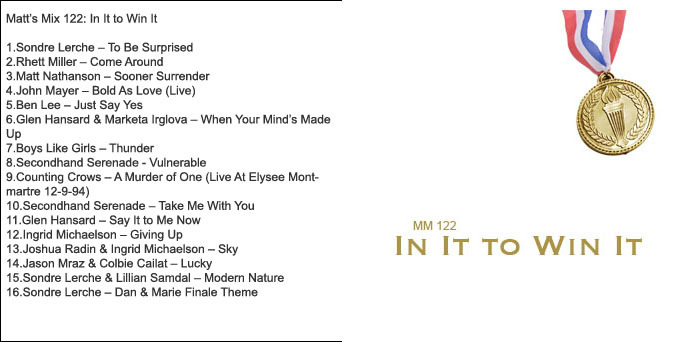 Still, I think it was all worth it for some of the gems that eventually made their way onto this mix. 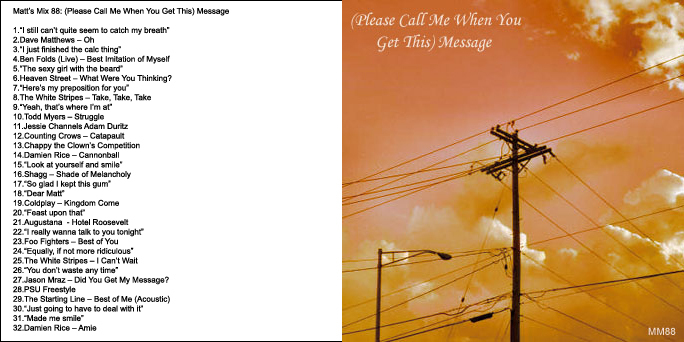 I used the voicemail recordings as lead-ins to the tracks to create (what I think is) a compelling, personalized mix of phone messages and songs. I often associate certain songs with seasons of the year. Living in Erie all of my life, I have been blessed/cursed with the changing of the seasons as a way to mark the passing of time. While I am a vocal anti-winter person in general, one way that I cope with the cold is through music. 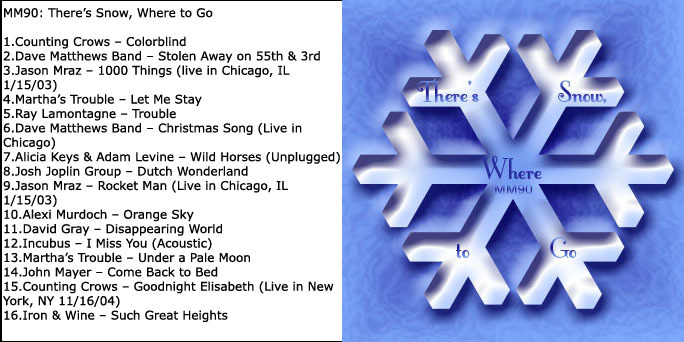 There’s Snow, Where to Go remains my favorite winter music compilation to this date. It’s the perfect soundtrack for a gray, snowy day under the blankets. 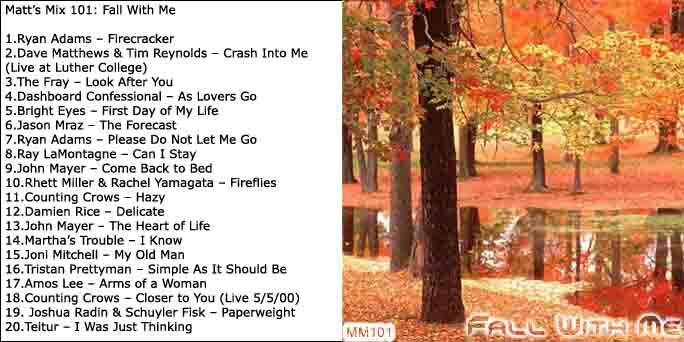 Speaking of seasonal music mixes, Fall With Me is my top choice for autumn. When the leaves begin to turn yellow and red, there is a good chance that these songs will be playing in my head. Created in June of 2010 during the extended breakup period with Jessie, the CD title and album art (or lack thereof) tells the story. Were Jessie and I destined to be two individuals or would we come together as one? Twone hinted that even though we were broken up, and not intertwined in day-to-day life at the time, we were intertwined at least in each other’s minds. The black text on a plain white background also signified the void that was left when we broke up. I created Brand New Day in June of 2005. It was an optimistic mix of music meant to represent the passing of one summer day. “Singing in My Sleep” represents the dreaming before waking up. Then, Ben Lee’s “Light” signifies a sunrise, punctuated by triumphant trumpets. The rest of the songs play out the course of the day before ending with The Faces’ “Ooh La La” looks back nostalgically with the refrain of “I wish that I knew what I know now / when I was younger.” I remember the progression of songs and the story I was trying to tell with them so well for this mix because I recall that I explained it to Jessie during a break we shared while working at Giant Eagle that summer. It was one of the first times I had talked someone through an explanation of one of my Matt’s Mixes. Not only did she listen, but also she genuinely cared and appreciated the artistic process I went through in creating the mix. It was another sign that summer that we had a special chemistry together. I kind of made a big deal out of turning 30 last year. In addition to creating lists like the one you’re reading right now and creating mixes and write-ups for my ongoing 30 at 30 countdown of my favorite music artists, I also made a Matt’s Mix to commemorate the big 3-0. In addition to being mathematically sound, 30 > 20 represented my attitude as I hit the milestone age marker. I really enjoyed my 20s, but I am optimistic that my 30s will be even better. I’m only 9 months in, but with my first child on the way this fall, I think I’m off to a great start for making 30 > 20 a reality. The mix of music was spot on, too. This past April marked the 10-year anniversary of when Jessie and I had our first “date” together (see #1 on this list for more on that). As you can tell from reading through this list, Matt’s Mixes have been heavily influenced and inspired by Jessie over the past 10 years. So it seemed only fitting to commemorate this milestone with a mix full of signature Matt and Jessie songs that span the past decade of our relationship. From the pre-dating feeler email Jessie sent me that used questions from Dashboard Confessional’s “So Impossible” to Ben Sollee & Daniel Martin Moore’s “Try” that we used to announce the pregnancy, A Decade in the Making plays like a greatest hits of the Jessie-related Matt’s Mixes. This mix was the aforementioned game changer. The first of a three-part series, August ‘o4 and Everything After marked the beginning of a new chapter in my life and in Matt’s Mixes. The roman numerals were out. Standard numerals and individual mix titles were in. 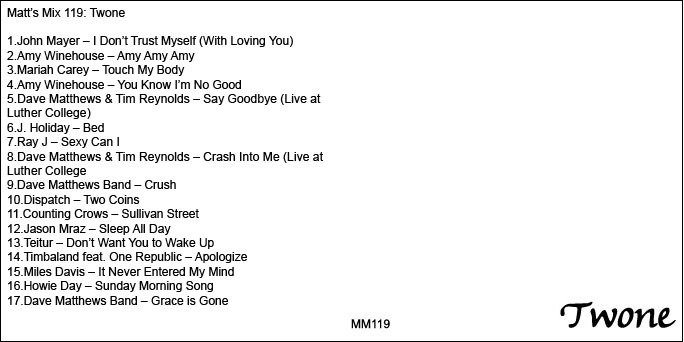 It should come as no surprise that the first “modern era” Matt’s Mix was loaded with seven Counting Crows songs, including rare live tracks and spoken intros from Adam Duritz. 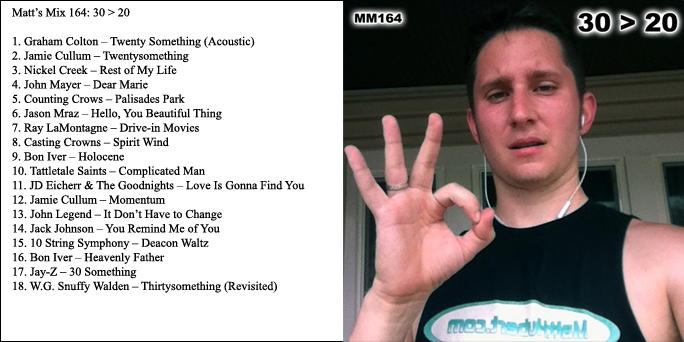 Posing with the 12 different versions of Matt’s Mix 100. Unsurprisingly, I felt the need to make Matt’s Mix 100 special. 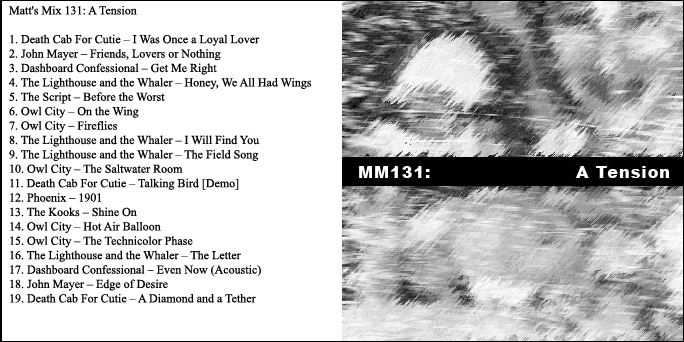 I made 12 different versions of this mix MM100a, MM100b, MM100c, etc. Each version was a unique piece of the puzzle (see the photo on the left). I kept one for myself, gave 10 others to important people in my life, and saved the 12th one as a symbol of all the important people/pieces that I had yet to meet. Jessie and I have a tradition of brainstorming a to-do list at the beginning of every summer. 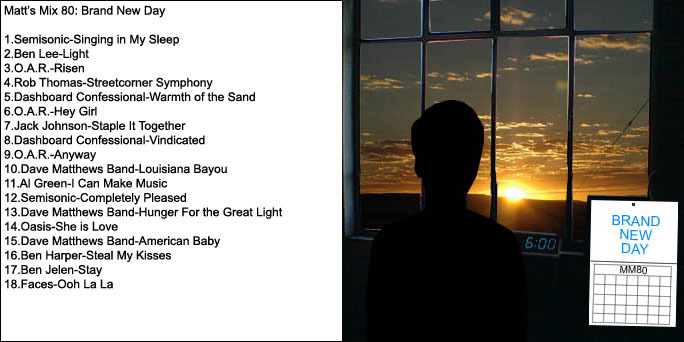 One of the things I was sure to suggest for the summer 2010 list was to see a sunrise. July 3, 2010, was the date it happened. With these songs playing in the background, we took in the beauty of a Presque Isle sunrise while playing gin rummy on the beach. Eventually, I gathered up the courage to ask her if she wanted to take a walk along the water. After a short walk, I got down on one knee and prefaced THE question with “I want to share all of our sunrises, sunsets, and everything in between.” She said yes, and just like that, we were engaged! This night inspired a lengthy journal article and a poem, but no words can capture the magic of that night the way this mix does. The night was April 15, 2005, a date Jessie and I affectionately refer to as simply “4.15.15.” It was not an official date at all. In fact, it only happened because Jessie was resigned to thinking that she would not be able to attend her dream school Allegheny and therefore wanted to tour Mercyhurst. She knew I went there and asked if I could show her around. The night had it all. She played Ben Folds in the piano recital room. Then I played my dad’s old Billy Ocean and Billy Joel records in his studio. Later, she blindsided me by absolutely crushing Eminem’s verse in “Patiently Waiting” while he sat in Garvey Park. Then I played her songs from The Beatles’ White Album (and she taught me about harmony) as we shared Dairy Queen ice cream. Truly, the soundtrack was an instrumental component of what, by night’s end, was absolutely a first date, albeit an unofficial one. There will never be another 4.15.05 and there will never be another mix that can transport us back to another time and place quite like this one.